Andalusia doesn’t belong in the San Francisco Bay Area. This four-piece outfit calls the Bay Area home, but their feet are not-so-firmly planted elsewhere. It’s somewhere higher up, in that mysterious, indefinable, swirling layer of the atmosphere where dreams live. But that’s not the only place they are. They’re in the studio, completing their second full-length album, they’re bringing their sonic assault to various Bay Area stages, and planning a 10-date West Coast tour for September 2003. Formed in 1996, Andalusia played for several years as a trio. Guitarist Cameron Ray, bassist Kirsten Burns, and drummer Jon Burns perfected their stark instrumental vibe while playing in clubs around the Bay Area, doing live and in-studio tapings for local cable television and radio broadcasts and touring the Pacific Northwest. 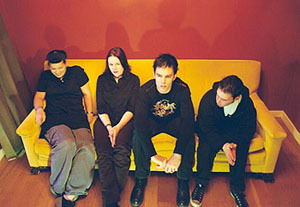 Andalusia also recorded and released the instrumental EP “This is Noplace” in 1999 and the full-length instrumental album (with occasional guest vocalists), “Such a Heavenly Eyesore” in 2001. 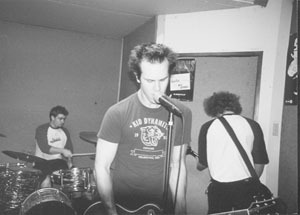 Andalusia added a permanent vocalist in April 2002. Suzi Maclay brought her ethereal voice to Andalusia in time to see tracks from “Such a Heavenly Eyesore” added to more than 100 college radio station playlists, and two featured on MTV’s “Road Rules” in the Summer of 2002. 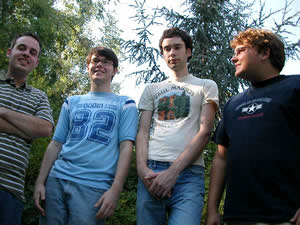 In March 2003, the band released a four-song, limited-edition EP, “Demonstration.” Aside from frequent Bay Area performances, Andalusia has hit the road on numerous tours throughout the United States. But whether burned into the binary realm of a compact disc or presented to you directly from the players, Andalusia’s sound keeps you wondering if you’re emerging from a dream or perhaps just entering into one. Kirsten’s bass lays down a molasses-heavy framework from which you venture off to follow the tangents presented by Cameron’s guitar journeys and Suzi’s chameleon melodies – part angel, part siren, but undeniably alluring. Jon keeps the rhythm, fueling you through the crescendos and valleys, reminding you that you’re not lost, just exploring. The songs are alive, breathing into you and then extending a hand to beckon you forth. You can trust that what you see will be yours alone, an individual adventure constrained only by your willingness to leap. But no matter where Andalusia takes you, they will always bring you back. Just don’t be surprised when you wake up, only to find that you’ve drifted off, left introspective, retrospective, undoubtedly with a different perspective than that with which you came.